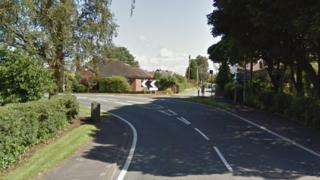 The man, in his 30s, was involved in a crash with a VW Golf on Riley Lane, Wigan at about 14:30 BST. Paramedics attempted to resuscitate him but he was pronounced dead at the scene. The car driver remained at the scene to speak with police. No arrests have been made and inquiries are ongoing.